Eden Farms has a large variety of fertilizers for your every need. We offer a 4-step program for your lawn, all-purpose solutions for your vegetable garden, bloom booster for your annuals, and even aluminum sulfate to keep your hydrangeas that beautiful blue. Just let us know your garden needs and we will happily find the fertilizer solution for you. Espoma™ has been around a long time and have been authentically involved in producing organic fertilizers since before it became a hot field. 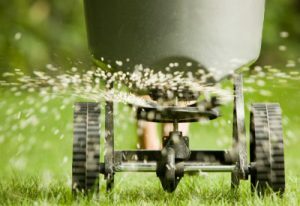 Some of their products are “bridge” or “organic based lawn fertilizers” and not truly organic, but they do offer truly organic lawn fertilizers as well. Espoma™ Organic Lawn Food is a 9-0-0 analysis and is designed for use on your lawn at any time of the year. 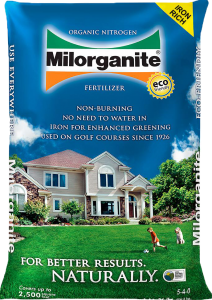 Milorganite™ 36 lb. Organic Nitrogen Fertilizer is good for promoting healthy growth of lawns, trees, shrubs and flowers. The non-burning organic-nitrogen feeds up to 10 weeks and the iron delivers a long-lasting green. The slow-release formula helps reduce mowing, conserve water, and is non-leaching. Trust the fertilizer that has been proven effective for over 90 years. 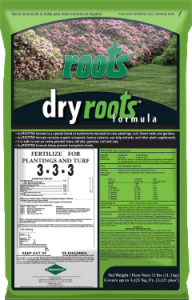 dryROOTS™ formula is a special blend of nutrients formulated for new plantings, turf, flower beds and gardens. dryROOTS™ formula contains organic composts, humus extracts, sea kelp extracts, and other plant supplements. It is safe to use on newly planted trees, shrubs, gardens, turf and sod. dryROOTS™ formula helps prevent transplant shock and minimizes loss. 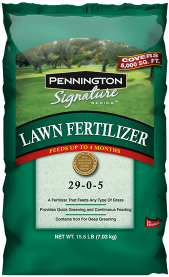 Pennington™ Fertilizers have a high phosphorous content which is ideal for new plant development as it encourages strong root development. Their fertilizers are specially formulated for new lawns from sod, seed, or grass plugs. They provide all of the essential nutrients that are necessary for getting new plants and grasses off to a good start.